Perhaps that is just a bit exaggerated, but it does have the same effect. 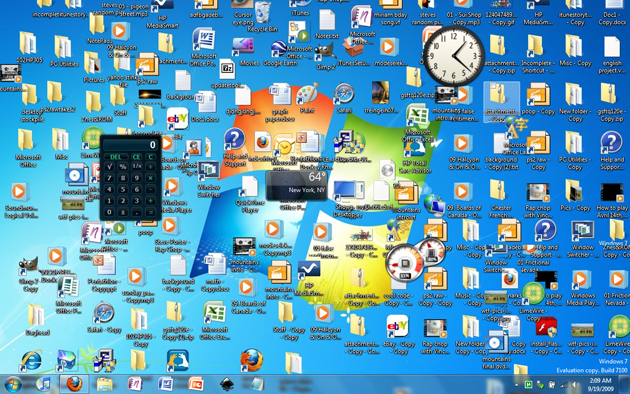 There are any number of ways for Windows 7 users to organize desktops. Stardock offers a solution to Windows users in its product called Fences. In the past I have purchased various Stardock products that work to make the Windows environment customizable. Fences is a product that allows Windows users to create areas on the desktop called “fences” to place desktop icons for programs and files. These fences are customizable, allowing users to give them their own titles. My own desktop is customized with “fences” entitled 1)Programs Used Most, 2)Working Docs, 3) Important Docs (Forms), and 4)Docs to Read. Users can create their own fences to organize their own desktop icons. Stardoc Fences is currently available a “Free Version” for personal use and a “Fences Pro” version is available for a small fee. The free version allows users to completely organize their desktop in fences. Fences Pro allows users to customize and automate desktop icon placement. Stardock Fences is an easy, effective way for administrators and other educators to organize a desktop so that programs and most commonly used files are easily accessible. To download the Free Version of Stardock Fences or to see more information about Stardock Fences Pro, check out their website at http://www.stardock.com/products/fences/.